Benefits: Black walnut is a deciduous tree valued for its timber and is common in the western states of northeast America. Herbal preparations derived from black walnut have been used as hair dyes (due to its dark colour). It can be applied topically for the treatment of acne, inflammatory diseases, ringworm and fungal, bacterial or viral infections. Traditionally the black walnut leaves are of the highest value for curing scrofulous diseases, including herpes, eczema, cold sores, warts, acne, psoriasis and for healing indolent ulcers. Obstinate ulcers were said to be cured with sugar well saturated with a strong decoction of black walnut leaves. It is an excellent remedy in combination with other herbs for worms, intestinal parasites such as pinworm, ringworm and tapeworm. It is used in fungal, bacterial and viral infections such as candida, athlete’s foot, sore throat and tonsillitis. 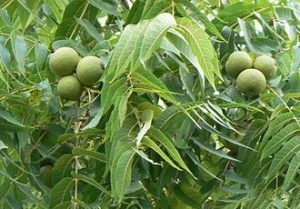 Black Walnut is also indicated for constipation, diarrhea, reduce excessive sweating, menorrhagia, and skin and parasitic infections. Pharmacological Actions: Alterative, astringent, laxative, anthelmintic (bitter), antiviral and anti-inflammatory. Contraindications: None known at present, however avoid using during pregnancy.